Carrying on with this series, the next type of success you can produce in PPC is ‘conversion success’. For all those that are new to this term, a conversion is when the person who has clicked on your advert has successfully performed an action which you intended for your advert to do. This can be from buying a product/service to entering information about themselves or to simply tweeting your landing page. A conversion is what advertisers aim to get from their PPC campaigns. This means that the higher percentage of traffic that your landing page gets that are conversions, the better. From this, here are a few ways you can increase your conversion rate to make your campaign run much more efficiently and effectively. 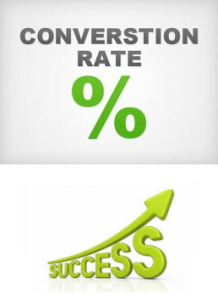 Firstly, you need to know why increasing your conversion rate will bring success to your campaign. Think of your landing page as a high street shop. If people go into your shop (which is metaphorical for visiting your landing page) and don’t buy anything (don’t convert), you won’t have benefited from their visit in any way. However, if people go into your shop and buy stuff, you will make money. The more people that go into your shop and buy things the more you will make. Therefore, the more people that visit your landing page and perform your desired action, the more beneficial it will prove to be to you. One way you can increase the conversion rate of your campaign is by choosing the right type of landing page for your campaign. The article, ‘Different Types of Landing Pages‘, goes through all the possible types of landing pages you can have for your campaign. Each landing page has a different purpose which will produce different results. Choosing the right type of landing page for your campaign can aid to increase your conversion rate as different types of campaigns will lead to different types of actions from the clicker. You just need to match the landing page to the action your clickers will most likely do. One of the problems with internet users though is that it is very difficult to make them perform actions of your desire without annoying them causing them to exit/bounce off the page. Therefore, your aim is to not annoy the visitors of your landing page by making them perform many actions for your benefit. Internet users have the shortest attention span making them very difficult to keep on a web page for long. My point I’m trying to make is to not ask too much from your visitors: they will only do as much as they will want to do. You will be able to tell how patient your visitors are by installing Google Analytics onto your landing page. A low average time on your landing page clearly shows that your visitors are clicking away from your landing page and are not as interested in your landing page as you had hoped. This will make it difficult to gain a high conversion rate if you ask for much action from these type of visitors. Therefore, if your average time on your landing page is low, you cannot expect much action from the visitor. However, if your average time on your site is high, they will be more interested in your landing page and will be easier to make them perform an action providing a successful conversion for your PPC campaign. Link Building Requirements – What Links Do I Need?